Thanksgiving is upon us. We at the Swedish Heritage Center have so much to be thankful for in the past year. First of all, it was great to have a beautiful garden and green yard this summer. Thanks to our FOOF grant it was easy to accomplish such a beautiful garden with the help of our sprinkler system. Thanks FOOF for your support. Then came September and God sent us Tom Wallerstedt. Like an angel from heaven, we now have a full time curator. Not only a curator but someone who just loves the Heritage center and its mission. Tom, his siblings, Barbara and Patty have rearranged, redesigned and relocated about every article in the place. Thanks also to our new great board for all their work and imput to our new beginning. We have been working hard and now its showtime. December is a busy month. Please mark your calendars for our upcoming events. Our first event is Sunday December 7th. We will be selling the Oakland Women’s Club Tour of Homes tickets. The hours are 12:00 till 3:00. 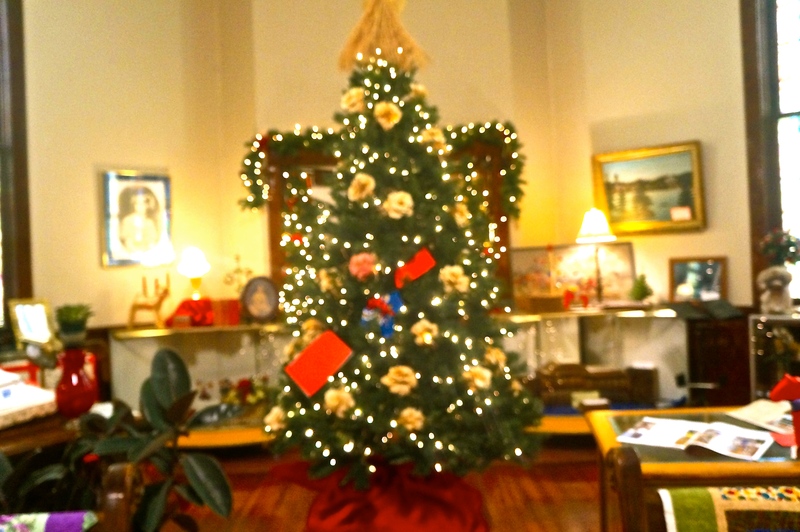 Come early to enjoy the Swedish Heritage Center’s Christmas splendor. If not on Sunday– come back when you have more time to study all the lovely articles on display from years past. Thursday, December 11th will be double busy ,with a full day of activities. The 4th graders will be preforming their Santa Lucia Festival. There will be also some musical selections by other grade school students. There will be 2 preformances at 9:00 which will be open to the public, parents, and grandparents. This is one production that you won’t want to miss. Thursday evening at 4:30 till 9:00 we are hosting a Swedish H’ourdorves, Wine and Cheese Christmas Party. Support the Swedish Heritage Center. The cost is $15.00 for H’ourdorves and one drink ticket. A cash bar will be available featuring our new Dala Horse Signature drink. Enjoy a festive night our for cocktails with your sweetie and enjoy the Christmas season. Sunday, December 14th enjoy the sights and sounds of Christmas. The Burt County Brass will preforming at 5:00 p.m. Following the concert, we will be serving a traditional Swedish Christmas meal. Swedish potato sausage, meatballs, scalloped potatoes, green beans with almonds, Swedish rye bread and Ostakaka for dessert. Tickets are $10.00 for the meal. A cash bar will also be available. Tickets are on sale at Nelson’s Food Pride for both events. During this holiday season please give the Swedish Heritage Center your attendance, support and also monetary. Remember, we have no source of income except your donations. We would love to have you host your family reunions, Christmas parties, card parties or any other get togethers at the heritage center. Give a call to reserve the museum at 402-685-5652. Christmas tree at the Swedish Heritage Center. Photo Credit/Denise Gilliland, Editor and Chief, Kat Country Hub. An extra thanks to all who have contributed this past couple months . You know who you are, the cookie bakers, cleaners, gardners, pew repairers, advertising,and overall support. We thank you!! Penelope Chi Tran. Photo Credit/Tri Tran. announce the birth of their first child, a daughter, Penelope Chi Tran. 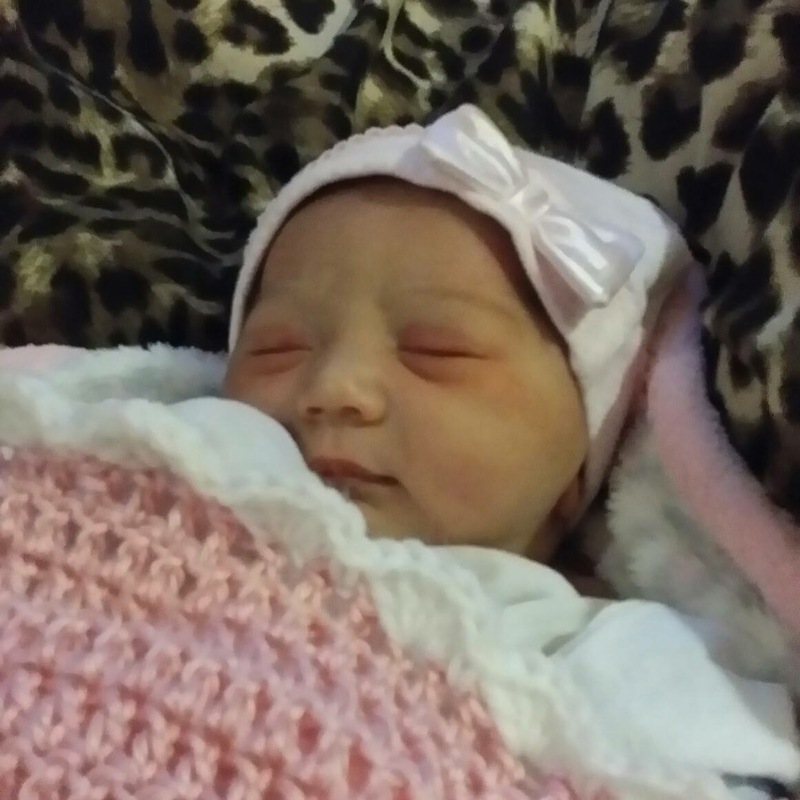 Penelope was born on November 21st at 12:09 p.m. She weighed 8 pounds 3 ounces and was 21 inches long. Penelope’s grandparents are Denise and Jeff Gilliland of Oakland, NE, Terry and Tammy Storie of Lakeland, FL and Anh and Nam Tran of Wakefield, NE. Her great-grandparents are Pauline Marr of Oakland, NE and Opal and Elvin Gilliland of Lyons, NE. Happy Thanksgiving. Have a blessed day with your loved ones. I thought I would share some tips I received from someone on how to celebrate Thanksgiving. Interesting and fun. Watch the Thanksgiving Day Parade, no matter how old you are. Don’t try to clean the turkey with utensils alone — it just doesn’t work. Continue old traditions, but also add new ones. Keep a fire extinguisher near the kitchen — always. Wear stretch pants. Enough said. Remember that peppermint soothes the digestive system after overeating. Reflect on the things for which you’re grateful. Make naps mandatory after dinner. Start searching for food container lids early. They deliberately hide themselves. Embrace the quirks of family and friends. 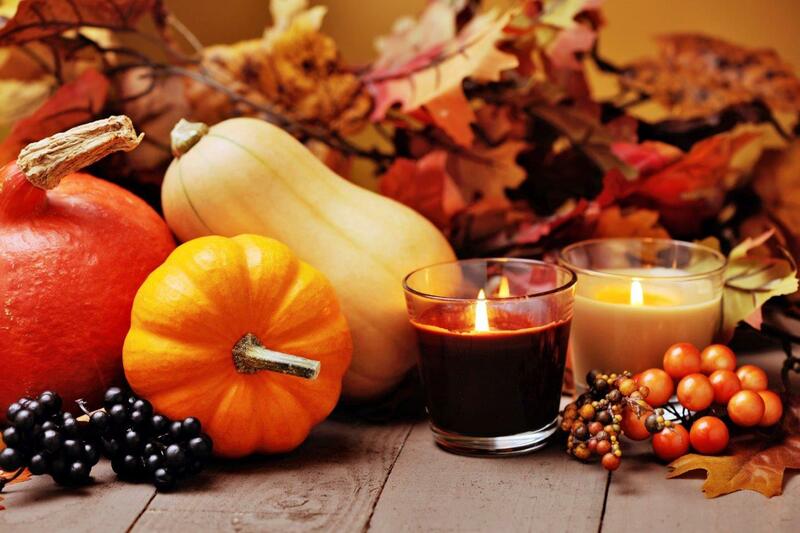 Happy Thanksgiving to you and yours from Kat Country Hub. BYRON STEELE MORROW, 53 years of Tekamah, Nebraska, passed away November 24, 2014, at his home in Tekamah. Byron was born to Walter and Elizabeth (Mahon) Morrow June 1, 1961 in San Bernardino, California. During high school, he moved with his family to the Decatur area, and he graduated from Lyons High School in 1979. Byron spent much of his working life driving truck for various employers in the area. He was an avid fisherman, spending two weeks a year in Canada. He was preceded in death by his mother, Elizabeth Morrow. Survivors include his three daughters and two granddaughters, Heather Morrow and Ryann Rodriguez, Amber Morrow, Ashley Stevens and Melody Capalite all of Tekamah; his father and stepmother, Walt and Patty Morrow of Lyons; two brothers, Tony Morrow of Seattle, WA and Tom Morrow of Phoenix, AZ; and one niece, Sarah Morrow of Seattle, WA. Happy Thanksgiving! As we gather together with family and friends to give thanks for all the wonderful blessings we have been given this past year, I wanted to say thanks to all of you for making Lyons such a great place to live. I am so blessed to be mayor of this wonderful little community. It is hard to count all the wonderful things this past year we have accomplished. All of it made possible because of your belief in the fact that all things are possible when we put our collective minds to it! One of those many wonderful things I’m thankful for is the remodeling of the auditorium. I know many of you are curious about the progress being made. Unlike the pool where progress was visible out in the open, the auditorium is not transforming before our eyes because it is all in-doors. I can tell you it is transforming. The floor of the old fire hall has been removed and is being prepped for a new flat one. The men’s and handicap bathrooms are gone. Even a large portion of the central wall has been torn down to open up the space between the two rooms. When the new floor to ceiling windows go in where the bay garage doors are now is when things will really start to look good. So we are making progress. We had the election. It looks like we will have a new council member for the first time in eight years. 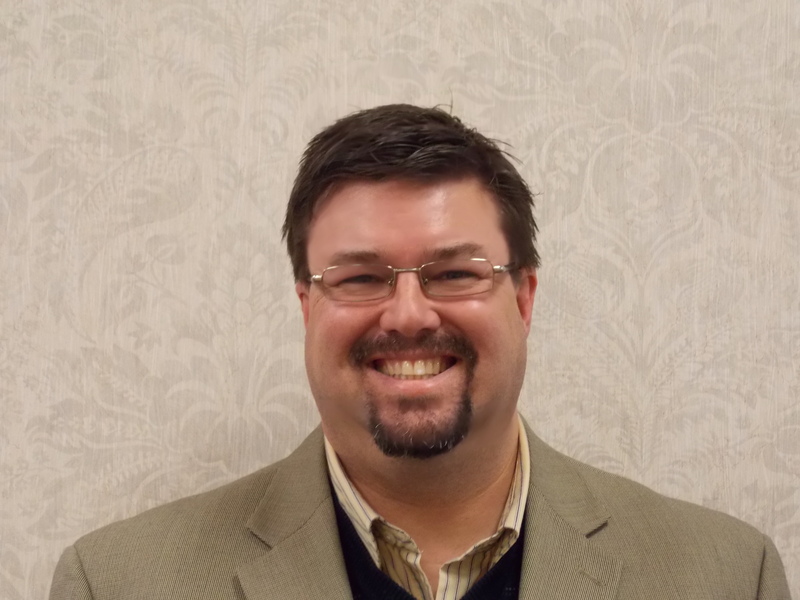 Congratulations to Kyle Brink who will be taking over for Roger Anderson. I think Kyle will make a fine addition to the council. I’m excited to get to work with him. I do however want to give a big “thank you” to Roger for all his years of service to the City of Lyons. Lyons is a better place because of Roger’s commitment to the future of this community. He has been a constant source of knowledge and level headedness. He has given selflessly of his time and energy all in the name of community improvement. I’m a better mayor thanks in part to Roger’s wisdom and counsel. It takes a special type of person to be a city council person. Roger has proven to be a very special person in my book. Roger’s last council meeting as a councilman is December’s. Please take the time when you see him to thank him for his service to Lyons. He deserves a big pat on the back! As we move forward towards the next four years, part of me hopes we are as busy as or busier than we have been the last four years. The other part of me hopes it is a lot less! I feel good about the direction the city moving. Like I said, we have lots of things to be thankful for. I hope you all feel the same way. Enjoy your holiday. Good luck with your power shopping on Friday! Take care, be safe and we’ll talk to you soon. Work has been suspended on the roundabout project at highway 77/32 junction until next spring. The project is set to start again next spring, weather permitting. “We then will surface the temporary roads and redirect the traffic to them while completing the project,” Jeff said. More information will be available when the project begins again in the spring. Thanksgiving is when, as a nation, we give thanks for the important blessings in our lives. For many, that likely includes family, good health, a decent job, and the like. And we should be thankful if we enjoy any or all of those things. For some in our society, however, working hard doesn’t always produce enough income to make ends meet. And many rural and small town Americans depend on something that the rest of us don’t likely think about that often, the Earned Income Tax Credit (EITC), to help get through some of the tough times. The EITC is a credit against federal personal income taxes for working people who have low to moderate income, particularly those with children. The Census Bureau estimates that in 2012 the EITC kept an additional 5.4 million Americans, including 3 million children, above the official poverty line. A recent Center for Rural Affairs report (http://www.cfra.org/news/141107/impact-earned-income-tax-credit-rural-people) found that the EITC has become a rural program, vital to rural people and their well-being and important to the economies of the small towns they live in. Over one in five rural Americans claimed the ETIC, a greater percentage than among our urban neighbors. Being thankful for the EITC may seem odd to those who have never used it, but to one out of every five of my rural and small town neighbors, it has made all the difference, and for that I am truly thankful. 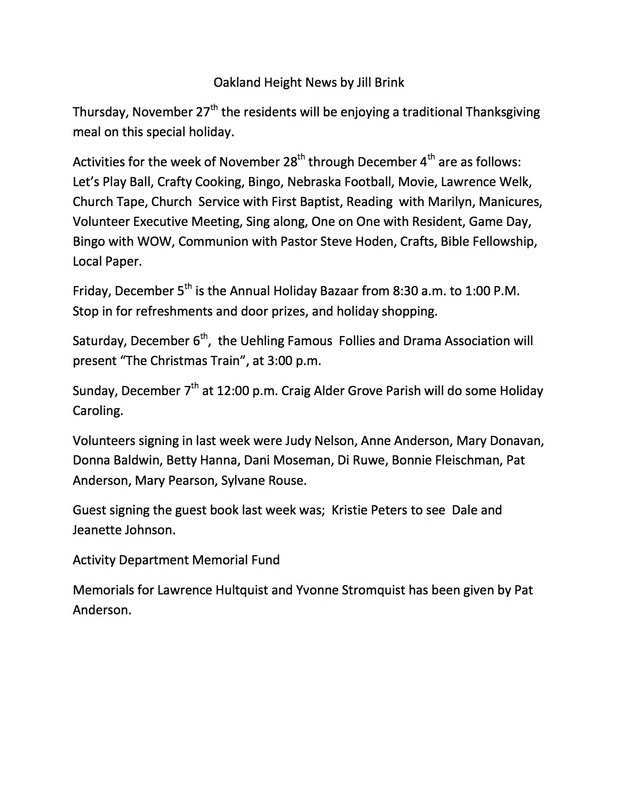 Get into the holiday spirit by attending the John G. Neihardt State Historic Site’s December “Sunday Afternoon at the Museum” program. 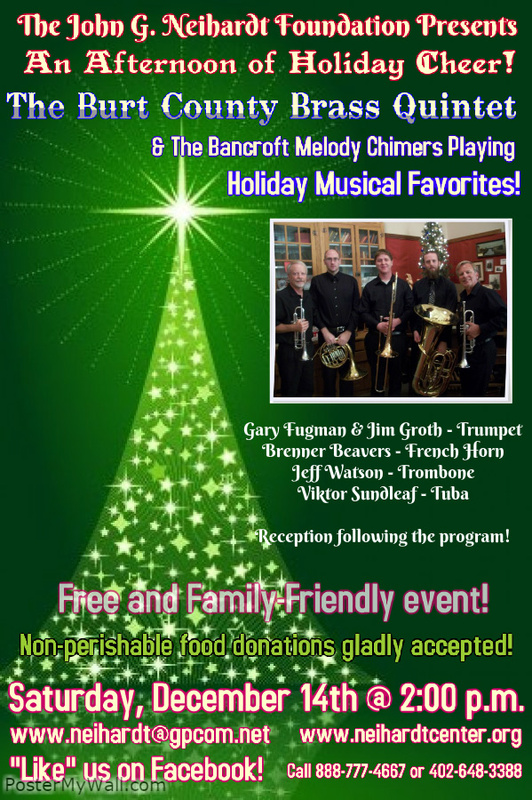 Mark your calendar for December 14 at 2:00 p.m., and don’t’ forget to bring your family, friends, and even your Grinch-y neighbor to Bancroft to rejoice at the holiday music of the Burt County Brass Quintet and the Bancroft Melody Chimers. The quintet features Gary Fugman (Decatur) and Jim Groth (Oakland) on trumpet; Brenner Beavers (Tekamah) playing the French horn; Jeff Watson (Lyons) playing trombone; and Viktor Sundleaf (Bancroft) playing tuba. Enjoy sweet treats, holiday décor, and good company after the program. You may even find a unique gift in our selection of books, CDs, and beaded jewelry. The Neihardt State Historic Site is located at 306 W. Elm St., Bancroft, Neb. Both the program and reception are free and open to the public. For more information, call 1-888-777-4667 or contact us through email at Neihardt @gpcom.net. “Like” us on Facebook at John G. Neihardt State Historic Site to stay informed about programming.